In a bid to start using things from my stash and experiment with little used tools, I’m on a mission to create 101 Gelli Prints. I was so keen to have a go with this that I ordered one in the States before they were available in the UK. I had it sent to a friend’s US address and then another friend picked it up when he visited. He then kindly brought it back to England for me. Then it gets a bit embarrassing! I took it out of it’s packet, gave it a half-hearted go and, dissatisfied with the results, I put it back on the shelf and never used it again. Until now that is. 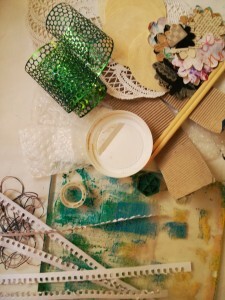 In the time between my Gelli Plate arriving and today there have been many more pictures and ideas posted around the web so I’ve got no excuse not to really test it out this time. 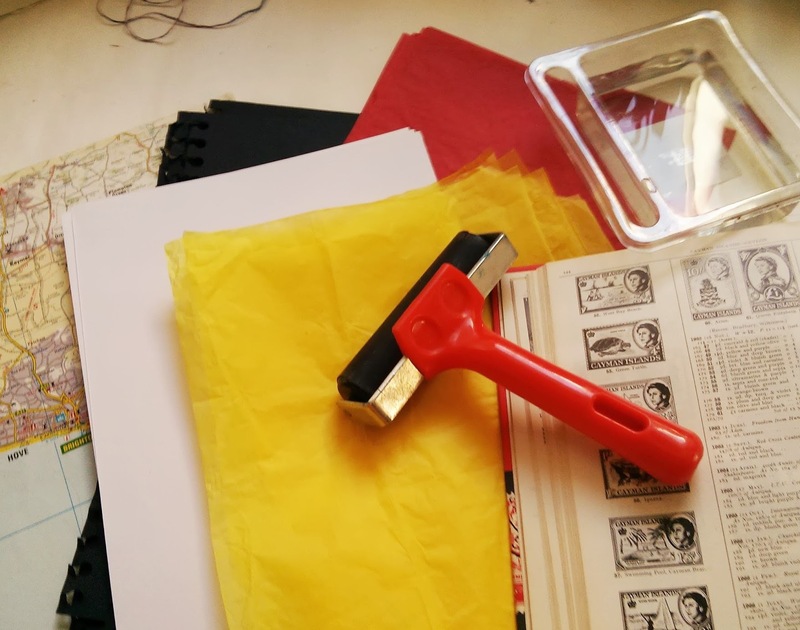 I started by gathering together a bunch of different papers including pages from a stamp collecting book, yellow and red tissue and plain black and white cartridge paper and some pages from an old atlas. I also collected a variety of mark making items and masks including chop sticks, paper flower die cuts, punchinella, string, torn paper holes, a sellotape spool, lid of a coffee cup, bubble wrap, paper doily, and corrugated card coffee holder. 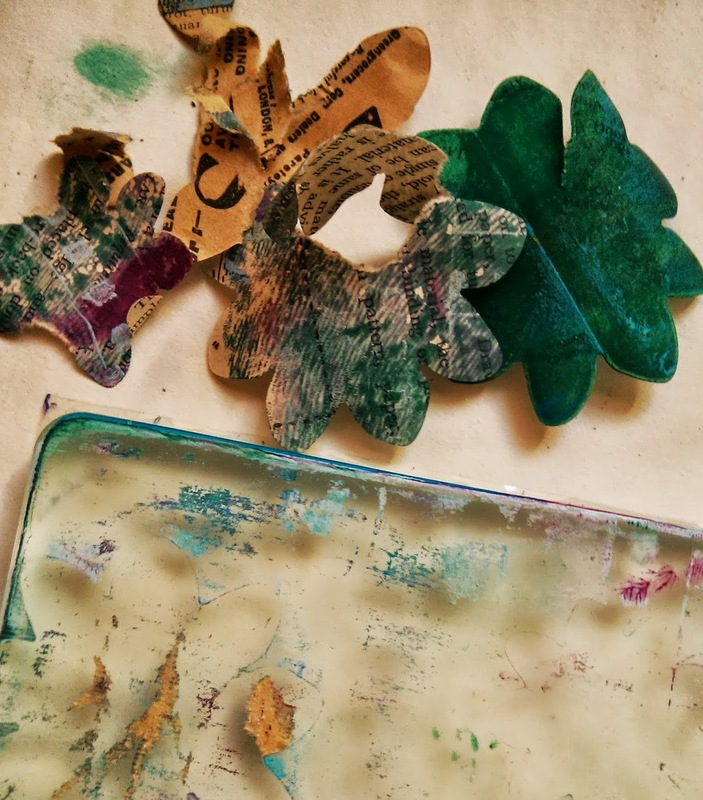 I’d read somewhere that if you left the old paint on your Gelli Plate you could get some interesting and unexpected effects when the old paint got lifted off with the new. That certainly turned out to be true but not quite the effects I was after. Not one of my better choices since the paint had dried overnight and didn’t lift no matter how much new paint I tried on top. In the end it took me half an hour to clean it all off so, I learned, although you can get some interesting effects by leaving paint behind on the Gelli it needs to be fairly recent and not thoroughly dried up! I had a similar experience using the die cut flowers and the paper doily. If the paper was too old or too thin I couldn’t get if off the plate without it sticking. 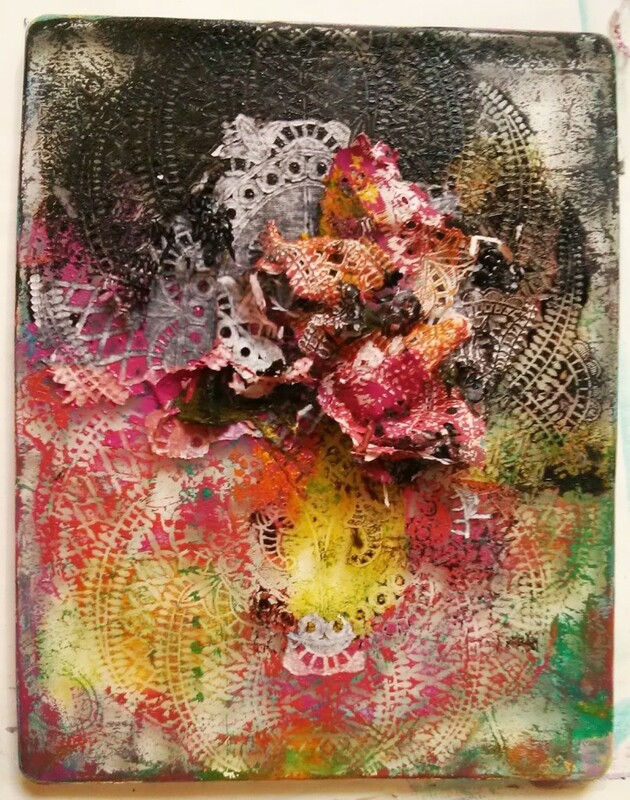 I have to admit, though, I do rather like the image created from the stuck doily despite the process resulting in another cleaning marathon. If you’re interested in this type of monoprinting please leave comments on the blog and follow my 101 Gelli Prints adventure by signing up at the top of the page. I’d say you could follow me on Pinterest (but that won’t show the full story), or Twitter and Facebook but I don’t really use those. I’m still currently an email in your in box kind of gal. Hope that works for you too! 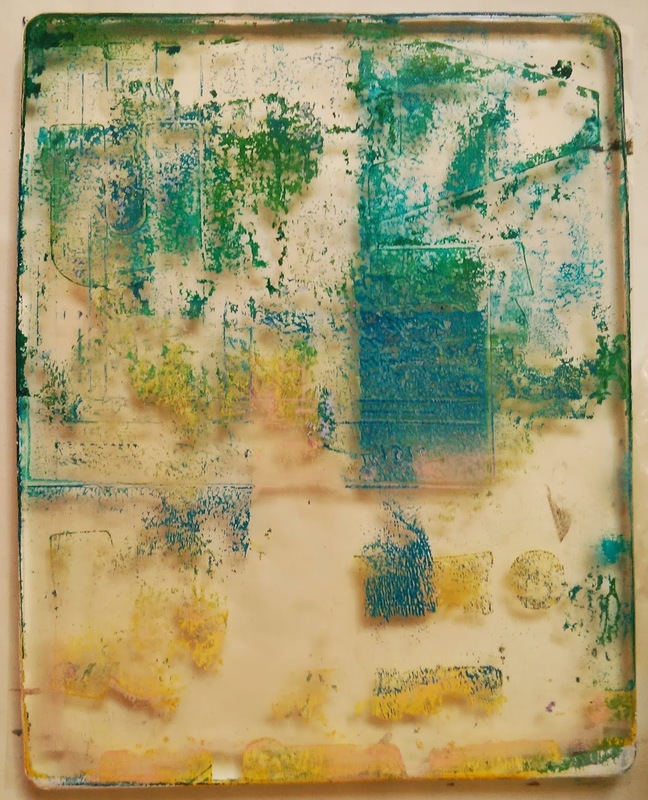 At time of writing – 10 of 101 Gelli Prints completed. Love your goal of creating 101 Gelli Prints! This is such a fun post and process…and adventure! I am new to Gelli Prints too and yours are stunning! HPPF! Wow, thanks for all the tips. I haven’t bought a Gelli plate but I have been trying to use that technique with freezer paper and some masks (some handout). Yours turned out great. Sounds like such a FUN goal!! 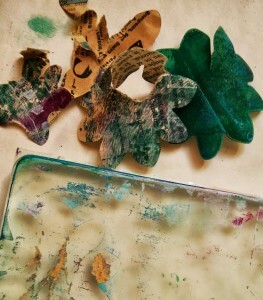 I am addicted to my gelli plate:) I’ve posted art several times -including this week’s post for PPF. I printed with a friend and we had a blast. If you lived close by you’d be most welcome! Happy PPF! So glad you gave it another go! Love all the different papers and texture and pattern makers you’ve gathered. The doily may have been a real nuisance to pull off but the plate but it left such great pattern on the plate and the doily itself is so colorful now! So glad you shared this with the party! I just made a gel plate myself. I think it is very brave to try and make 101 gelli prints. I think I will have to come back and check out what you have done to learn more about gelli printing. Thanks for commenting Monique and please do come back and check how it’s going. It’s always fun to know people are following along. If you go to the box at the top right of the page you can leave your email address and I’ll send you blog updates automatically.